The cultural diversity of contemporary Morocco reflects its historic vantage point as a gateway to Europe and the world. Morocco’s Jewish Heritage offers visitors an encounter with ancient historic traditions, customs, architecture, monuments and sites that have permeated Moroccan society for centuries. Travelers visiting Morocco on a limited timeframe during a journey at sea, have the option to enjoy a Casablanca Jewish Heritage Tour. For those interested in the history of Moroccan Jewry the perfect way to discover Morocco is on a shore excursion from the Casablanca Port. During a Casablanca Private Jewish Heritage Tour travelers will visit Casablanca’s Sacred Sites, Jewish Monuments, and the Jewish Quarter along with all of the highlights of old Casablanca. Some of the sites visited during a top end Casablanca Jewish Heritage Tour are Temple Beth-El, the Jewish Mellah, Casablanca’s Musuem of Moroccan Judaism and the opportunity to enjoy Kosher fare for lunch at a Kosher restaurant in Casablanca or the Jewish Club. Morning departure from your hotel or the Port in Casablanca. Casablanca is more affectionately known as Casa by the locals. The biggest city in the Maghreb, Casablanca is the heart of Moroccan business. Enjoy Casablanca’s vibrant new town, visit the old medina, lounge at beach clubs, and dine at seafood restaurants along the Corniche. Casablancaʼs 4,500 Jews now live mostly outside the mellah and worship in over 30 synagogues around the city. Throughout Casablanca you can find kosher restaurants, Jewish community centers, and Jewish schools. Start the Jewish Heritage Day Tour with visits to Casablanca’s Jewish Sacred sites, then continue on to see the highlights of old Casablanca. 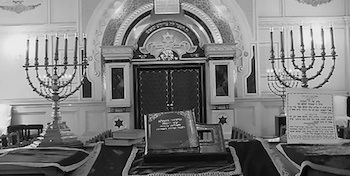 The synagogues, cemeteries, monuments, and communal institutions of Casablanca demonstrate the importance of the city to the Jewish community during the twentieth century. 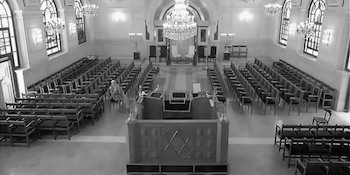 Visit Temple Beth-El, the Jewish Synagogue in Casablanca. Beth-El, is considered the centerpiece of a once vibrant Jewish community. The Synagogue has remarkable stained glass windows and many artistic elements. Visit the old Jewish Mellah of Casablanca. While Jews no longer live in the mellah, kosher butchers can still be found in the old market. The Jewish cemetery in the mellah is open and quiet, with well-kept white stone markers in French, Hebrew, and Spanish. Once a year, Casablancans celebrate a hiloula, or prayer festival, at the tomb of the Jewish saint, Eliahou. Visit the Museum of Moroccan Judaism in Casablanca, a museum of history and ethnography created by the Jewish Community of Casablanca in 1997 with the support of the Foundation of Jewish-Moroccan Cultural Heritage. The Museum holds the treasures of the Arab regionʼs only Jewish Museum. Using world-class standards of conservation for the collections, the Museum of Moroccan Judaism presents religious, ethnographic, and artistic objects that demonstrate the history, religion, traditions, and daily life of Jews in the context of Moroccan civilization. The Jewish Museum in Casablanca exhibits paintings, photography, and sculpture by Jewish-Moroccan artists. There are permanent exhibitions on Jewish religious and family life. Jewish-Moroccan artifacts like oil lamps, Torahs, Chanukah lamps, clothing, Jewish marriage contracts (ketubot), and Torah covers are also on display, as well as rooms depicting a complete Moroccan Jewish Synagogue. For research purposes the Museum houses a document research library, a video library, and a photo library. The Museum offers guided visits, seminars, and conferences on Jewish-Moroccan history and culture. On special request, it organizes group visits in Arabic, French, English, or Spanish. Visit Casablanca’s Jewish Cemetery. The Jewish Cemetery in the mellah is open and quiet, with well-kept white stone markers in French, Hebrew, and Spanish. Once a year, Casablancans celebrate a hiloula, or prayer festival, at the tomb of the Jewish saint, Eliahou. Visit Casablanca’s Jewish Club. Option, if time allows. Lunch Options: Kosher Food in Casablanca, Seafood, or Moroccan Fare. Kosher Jewish Lunch: Cercle de L’Alliance is a central Casablancan Jewish hangout and social spot with a cafe, a small bar, and a restaurant with great appetizers and an outstanding menu. E.J.J. A vegetarian restaurant that serves delicious fresh pizzas, pastas, and salads. La Truffe A fantastic kosher restaurant located in downtown Casablanca across from the medina. Seafood Seafood restaurants along the Corniche, El Mer, or Rick’s Cafe. After lunch visit Hassan II Mosque designed by the French architect Michel Pinseau. It is situated on a promontory looking out to the Atlantic, which can be seen through a gigantic glass floor with room for 25,000 worshippers. Its minaret is the world’s tallest at 210 meters. It is an enormous architectural masterpiece and the second largest religious building in the world. On Fridays, the Mosque of Hassan II is open to non-Muslims. The Mosque of Hassan II’s promontory offers lovely views overlooking Casa in the residential Anfa quarter. Visit the famous clock tower, Art Deco buildings, and the eleven-story Moretti apartment block on Boulevard Mohmmed V. Visit the famous residential blocks of the Glaoui, the Bessonneau, and the Asayag. Stroll the labyrinth of narrow streets lined with jewelers and artisanal shops. See La Squala, the fortified 18th century wall of the city. Visit the nearby shrine and tomb of Sidi Allal el-Kairouant, Casablanca’s patron saint.